Oh. My. Goodness! Is it Friday already? I suppose I could blame my lack of posts on my Internet connection which has been giving me fits lately, but really, I think I just had too much fun at the Whitney Awards last weekend. It’s taken me this long to recover. Your MC is just back from the gym (or a jog) and is going to take a shower. 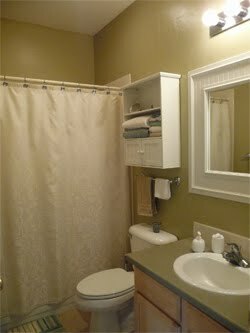 From this angle, everything in their bathroom looks perfectly normal. Write up to 1,000 words inspired by this photo/scenario. If you post your story on your blog, feel free to leave a link in the comments section. That was a fun one. Check out my attempt. I find it difficult to write something in the bathroom. It doesn't always have good memories.